From ‘Lady Marmalade’, written by Bob Crewe and Kenny Nolan. There are two things I’ve learned about marmalade – not only is it incredibly easy to make but, like the Lady herself, it’s a foolproof way to a man’s heart. Granted, the latter statement is based on fairly limited research, but so far I have had a 100% positive result. Run the idea of homemade marmalade by any man and watch his reaction. And let me know if you find a man who bucks the trend; I’d be intrigued. I’m not sure why I was so scared of marmalade for so many years; I’d always made jams and chutneys, but for some reason I thought marmalade was really difficult. 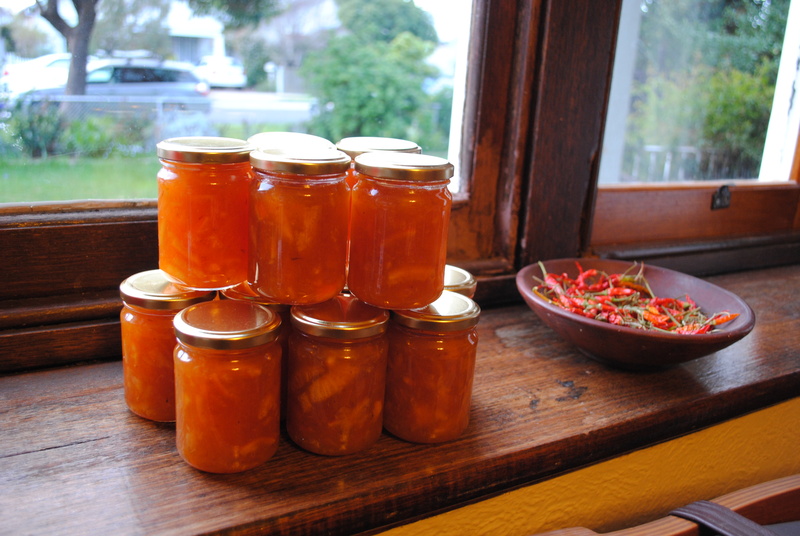 Three years ago, when I started helping out on the amazing Preserves & Chutneys Stall for the Clifton Hill Primary School Fair, my mate Sharen opened my eyes as to just how simple making marmalade is, and thus how simple is winning the heart of a man. 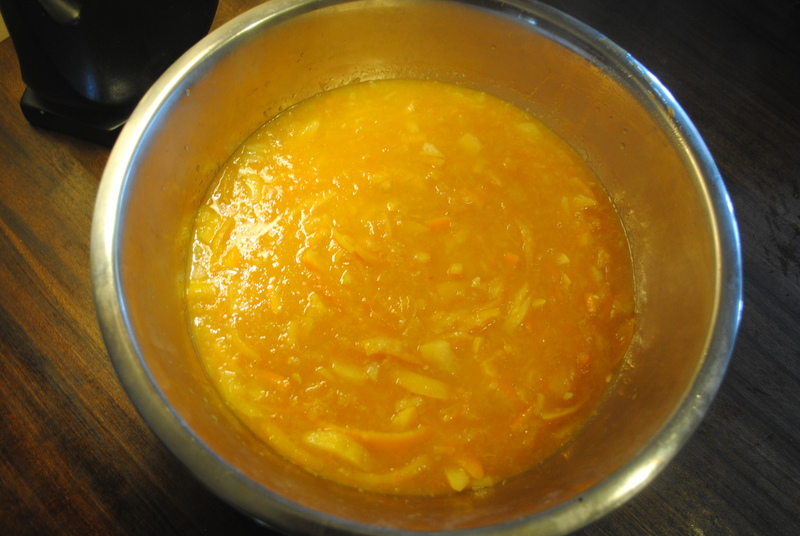 Since then, I’ve made bucket loads of marmalade, much of it from our own citrus trees. I’ve also now acquired a Kumquat tree in a pot (arguably not a citrus, I discovered), as Kumquat marmalade is something else, and seems to be generally revered. 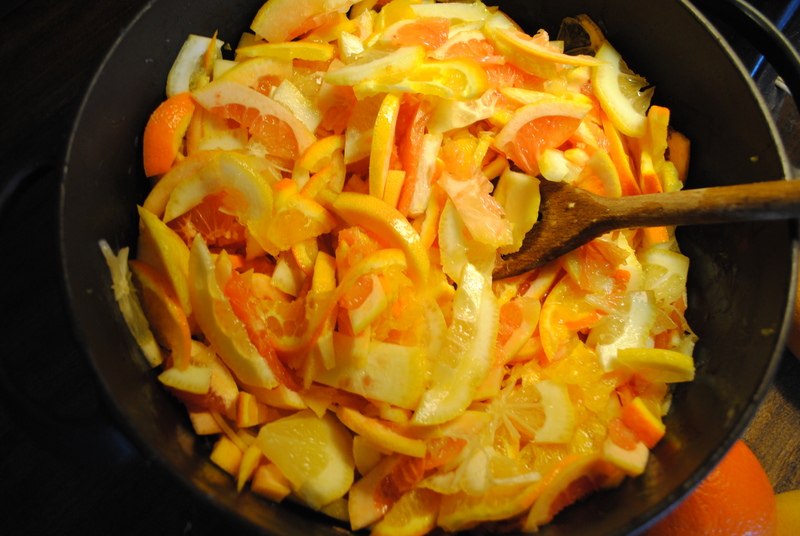 Thing is, you can make marmalade out of any combination of citrus you fancy, or just make the one you like the best. 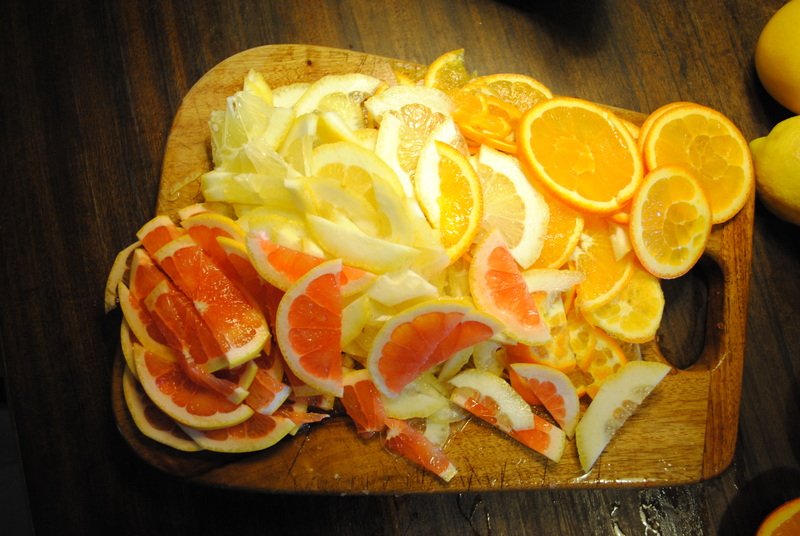 I prefer a three fruits marmalade, or Kumquat, so this is what I rustle up each citrus season. Below is the ‘recipe’ (in quotes, because you can hardly call it that), for Three Fruits Marmalade, to be adapted to any variation you so desire. To make 15 x 250ml jars you’ll need approximately three kilos of fruit, so I’ve used about a kilo each of oranges, ruby grapefruit and lemons (homegrown). I thought using ruby grapefruit would make the marmalade extra special, which, in fact, it did. You’ll also need about 4kgs of white sugar and a packet of pectin (just in case). Natural pectin, if you use it, is by far the best, such as apple pectin from a organic wholefoods shop. Slice all the fruit finely, as above, cutting off any brown marks on the skin, and then halve and halve again. You can remove a few of the seeds but these help with pectin production and can be skimmed off at the end, as they float to the surface. Measure out the fruit mixture in cups, as you need to add 1 cup of sugar for each cup of fruit. Put the fruit back on the stove, add in the sugar and stir it through. Bring the mixture to a boil, again stirring regularly to avoid the fruit catching. I use one of those old-fashioned (once were asbestos) mats to help to avoid burning any of my preserves or chutneys. While the marmalade is cooking, heat the oven to 150 degrees Celsius, leaving the jars in the oven for at least 5 minutes to sterilise them. Sterilise the lids in a bowl of boiling water. Pour the marmalade (using a jug or equivalent) into the hot jars, gently wipe the lip with a clean damp cloth, and put the lids on, tightly. You’ll need to use a tea-towel or cloth to handle the jars, as they’ll be very hot. 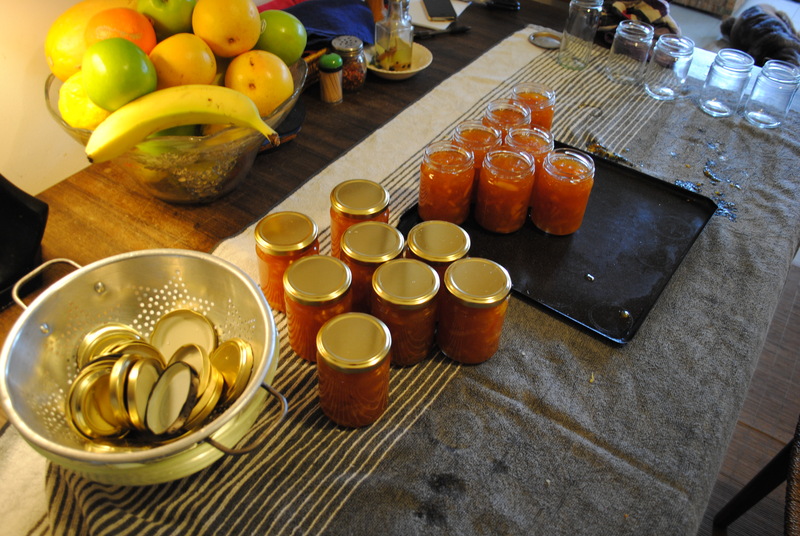 And there you have it; fifteen or so jars of marmalade. So easy. Almost as easy as Patti LaBelle’s voice. The Clifton Hill PS Fair is on Saturday 23rd November 2013, where you’ll be able to buy the above marmalade and lots more fantastic homemade preserves and chutneys, amongst other things. Labels designed by Stefan Morris.